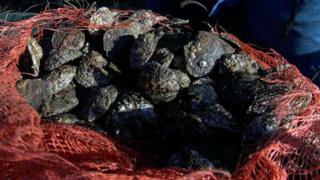 Thousands of oysters are being reintroduced to the Humber estuary for the first time in more than 60 years. The once thriving population died out in the 1950s due to overfishing and pollution. But 1,300 adults have arrived in Spurn Point from Loch Ryan in Scotland - and more are on the way. Yorkshire Wildlife Trust said it hoped the project would improve water quality and encourage marine life. Dr James Wood, fisheries and research manager at the trust, said another 5,000 adult oysters were due to arrive in August or September at the protected site in East Yorkshire, which juts 3.5 miles (6km) out to sea. Special permissions were granted to relocate the shellfish from the Scottish loch. They have been placed in special sacks and attached to trestles to protect them from predators. The wildlife trust is working with the University of Hull on the initiative. Environmental marine scientist Dr Magnus Johnson, from the university, said: "If we can have native oysters back in the Humber again, wouldn't that be wonderful? "At the moment Spurn is beautiful but on the inside it's just a sandy beach, that's about all there is there." Dr Johnson said establishing an oyster colony in the Humber would "encourage other animals to come along and really help develop the environment in that place". "A single adult oyster will filter a hundred litres of water a day. So if you have a big oyster reef on the Humber then it eventually will have an impact on the clarity of the water, which would be fantastic," he said. "It would be lovely to see the Humber go back to being something that it was 200 years ago before industrialisation."